"No, not the wheel of fortune, but the wheel that can conceal." There are a lot of people that stick to the regular two colored concealer, which tend to be peach and ivory, missing out on all the fabulous colors to conceal with. Using this approach could be considered counter color-attacking the areas that are bothering you. This is actually an ancient old knowledge, which painters have used for ages, and that is how you should see your face, like a perfect blank canvass, no matter what 14 century imperfection that is on it. Any imperfection can be used as a bases for perfection, that is the only way to reach perfection in anything, by improving on what one sees as imperfection. 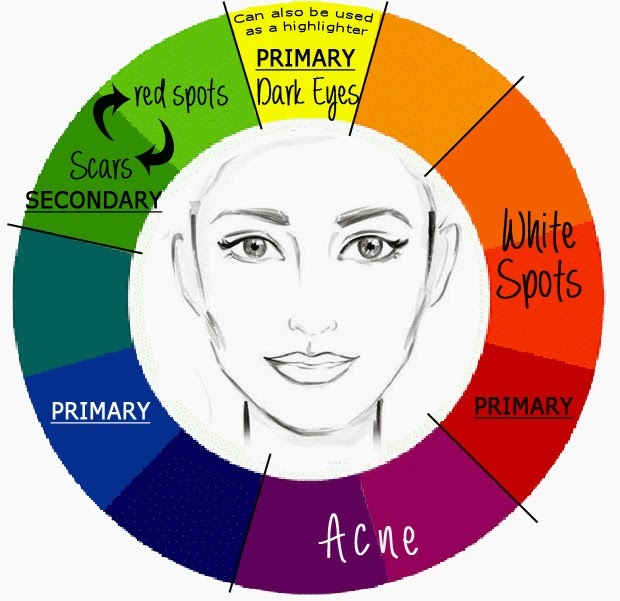 What we do with the Wheel is counter color correction, which is where we use one opposite color to correct a pigmentation upon our face, let me give you an example that will explain it so much easier. Dark Purple rings under your eyes, then you would look to your color chart and pick the opposite color on the chart, which in this case means, concealing with a Yellow color. Then you can add a tad of your regular concealer color to cover over the yellow, mixing it into your skin tone. Download Free Face Template with areas to conceal. and then you right click and choose 'save as', place it where you can find it again. The Blue color is a counter color to red areas and also dark circles. This color is perfect if you have been out in the sun too much and you have a slight scold, or a windburn. The color red is not really used, its the other colors in that range, such as orange or salmon, and they do wonders to dark areas. some also use this color for highlighting. PRIMARY colors are the ones that are mostly used, then you have the secondary colors and then the rest. Many people just stick to the primary colors, because they are also easier to find in the stores. Color Concealers - What Are They For? How To Use Them? Green, Purple, Blue, Yellow.